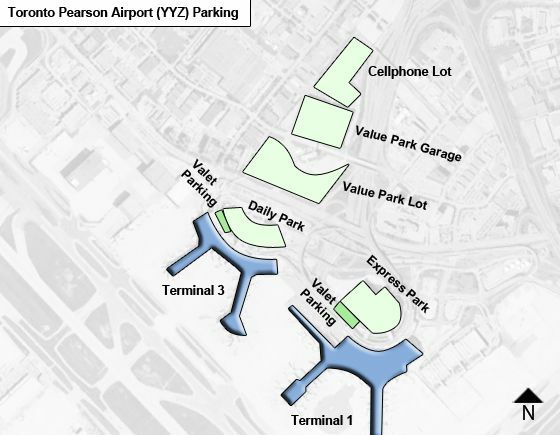 Toronto Pearson offers public parking spaces at both terminals, in addition to valet service at Terminal 1 and an off-airport Reduced Rate Parking Lot. Note height restrictions (see below). The GTAA also provides parking options for drivers dropping off and picking up passengers, such as short-term parking at the Cell Phone Lot. Dropping Off/Picking Up: When dropping off passengers at Toronto Pearson, you may stop momentarily on the curbside of the arrivals and departures levels. No parking permitted curbside, nor leaving your vehicle unattended. Traffic Officers who will enforce this directive. Unattended vehicles in No Parking areas will be ticketed and towed. Cell Phone Lot - Follow the sign to the 50-space Cell Phone Lot, located on Network Drive next to Highway 409, provides a safe and legal place where drivers can wait for arriving passengers to call you after they have deplaned and collected their luggage.. Maximum parking is 60 minutes. Vehicles must be turned off and attended at all times. The Cell Phone Lot is available and monitored 24 hrs/day. Parking Options and Fees: All fees quoted are in Canadian dollars, taxes included. 1. Short-Term Parking at Terminal 1 Garage: Available at premium location - best for parking under 4 hours. daily max (24 hrs) - $90. each add'l day after 1 week - $18. Add $20 to regular long-term parking rate. Payment Methods: By cash, credit or debit card, except at the Terminal 3 Parking Garage Pay-on-Foot terminals that accept cash or credit card only.